"Rachel Hollis is a live- out- loud leader with a heart for helping women tenaciously chase their purpose and dreams without apology. Rachel's ability to share stories and principles with raw honesty inspires her readers to discover and take the practical steps that will put them on a lifelong path of personal growth." "Ever felt stuck? Ever struggled to make time for your dreams- or struggled even to admit those dreams to yourself ? 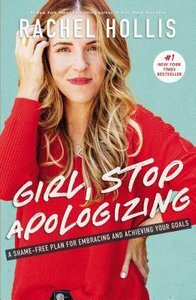 In Girl, Stop Apologizing, Rachel Hollis points out the pitfalls, challenges, and excuses that stop us from achieving our aims. She speaks with refreshing (and often hilarious) candor about her own experiences and mistakes, and off ers concrete advice about how to create the lives we want." "Girl, Stop Apologizing is the life- changing guide (and permission!) we've all needed to dump our excuses, embrace our dreams, set boundaries, and gain real confidence and momentum in life. It's how to overcome a 'lifetime of people pleasing' and start crafting the vibrant, authentic life you deserve. This is a must- read for taking your destiny into your own hands. I loved every page!" "Reading Girl, Stop Apologizing is like sitting down with a best friend who can speak deeply into the dark places you've been trying to hide and shines a light on them. Rachel has the ability to help you silence your inner mean girl while encouraging you to believe that you truly can change and become the woman you've always envisioned yourself to be. Rachel's gift is in giving you permission to not feel alone or ashamed of where you've been, while also giving you hope and a plan for what's ahead of you. Her voice in my ear has been a guiding light to pursue greatness and more for this one life I am living." "Rachel is the modern- day Oprah and female Tony Robbins! She provides a safe place for women to dream big and believe in themselves, while also giving the tough love all great moms give to their kids to take ownership of their life and providing the keys to succeed. Rachel is raw, real, and full of life. She combines emotion, humor, and straight- talk to make all of us believe and see how we can have the life we want if we've invested the time and learned how to get there. Get this book and stop apologizing!" "Though energy- evoking, motivation alone isn't enough to actually move the needle in your life. Rachel Hollis gets this at the deepest level possible. Girl, Stop Apologizing is a true masterpiece that combines heartfelt inspiration with the perfect mix of tools and a framework that can allow you to effectively adopt new behaviors and skills in your life that create real and lasting change." "Rachel Hollis is a force of inspiration who is impacting the world on a massive level. Her unapologetic message of self- worth will continue to transform lives for many decades to come." "Rachel is the leader in modern- day personal development for a reason. Her authenticity, vulnerability, and experience separate her from everyone else. She just knows how to 'get real' in a way that is unapologetically Rachel." "Girl, Stop Apologizing is an unfl inchingly relatable manifesto that is as unapologetic as it gets. Each chapter is an espresso shot that kickstarts your 'can- doitude' and challenges you to reach further and higher to achieve your goals." "It's time to truly embrace your greatness, and there is no better rally cry than Girl, Stop Apologizing. Unapologetic herself, Rachel is the fearless girlfriend you need to help you leap into the bold unknown and fulfi ll that big audacious goal you have been waiting to achieve. And that's a movement I'm thrilled to be a part of." Rachel Hollis, #1 New York Times bestselling author of Girl, Wash Your Face and host of the top-rated Rise podcast, urges women to stop apologizing for their desires, hopes, and dreams and instead to go after them with passion and confidence. Rachel Hollis has seen it too often: women being afraid of their own goals. They're afraid of embarrassment, of falling short of perfection, of not being enough. But the biggest fear of all is of being judged for having ambition at all. Having been taught to define themselves in light of other people-whether as wife, mother, daughter, friend, or team member-many women have forgotten who they are and what they were meant to be. In Girl, Stop Apologizing, entrepreneur and online personality (TheChicSite.com) Rachel Hollis encourages women to own their hopes, desires, and goals and reminds them they don't need permission to want more. With a call to women everywhere to stop talking themselves out of their dreams, Hollis identifies the excuses to let go of, the behaviors to adopt, and the skills to acquire on the path to growth, confidence, and the biggest possible version of their lives. Rachel Hollis is a #1 New York Times best-selling author of Girl, Wash Your Face, a tv personality, public speaker, podcast host, CCO the company she founded, and mother of four. Rachel was named by Inc. Magazine as one of the "Top 30 Entrepreneurs under 30" and she is deeply passionate about empowering women in business. As a speaker, Rachel brings her infectious and inspiring energy to every person she meets. Motivational, inspirational, and always approachable, Rachel's tell-it-like-it-is attitude is a refreshing approach that allows her to authentically connect with audiences everywhere. Her company, The Hollis Company is the foremost authority on premium digital content for women. With an online reach in the millions, Rachel has built a true and dedicated community all over the world. Where others strive to cast a wider net that rarely produces tangible results, The Hollis Company has succeeded by digging deeper. Rachel has worked with top brands like Walmart, Disney, JCPenney, Rubbermaid, Sprint, and Keurig just to name a few.